A lot of baseball played over these two days, 21 innings worth. After the complete collapse of the bullpen on Friday, last night the bullpen put in 8 full innings of scoreless ball until Dayron Varona got his walk-off double. 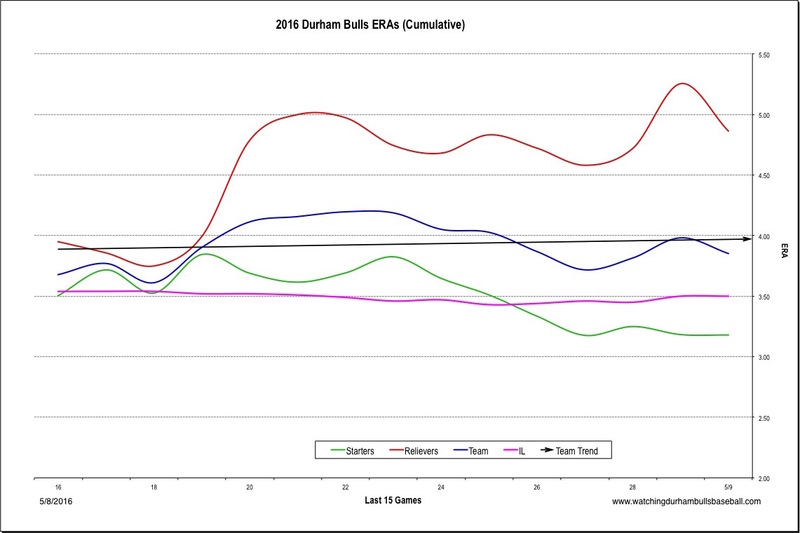 In fact, much of the Bulls’ troubles over the last two weeks points back to the relief crew as the updated ERA chart shows. The Bulls added another left-handed reliever for at least a couple of games. Adam Kolarek is up from Montgomery. Stats. He put in 2 1/3 scoreless innings last night. Matt Andriese has been called up to the Rays. Supposed to start today. Nice to see the relief corps’ trend inch down. 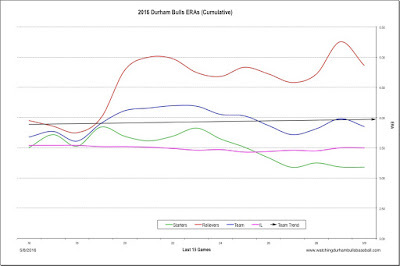 But it’s still running well-above the league average.